The next general election took place on Friday, February 23, 2018, nationwide. Voters previously registered on the electoral lists as they were arrested on September 30, 2017 were called to participate in the election of members of the National Assembly. President Ismael Omar Guelleh’s ruling party claimed a resounding victory in the parliamentary elections in Djibouti, taking nearly 90 percent of seats after the opposition largely boycotted the poll. The opposition party, Djiboutian MoDeL (Movement for Development and Freedom), decided not to participate in the forthcoming legislative elections, in accordance with the guidelines advocated by members of the National Council of the MoDeL which met during a working session on January 1st, 2018. In analyzing the political situation of the country, the National Council of the party considered that the conditions in which these legislative elections would be organized are biased in advance and would be incompatible with the expression of the popular sovereignty as already showed those of February 2013, the 2016 presidential elections and most recently the last communal elections of February 2017, in which no opposition party took part. 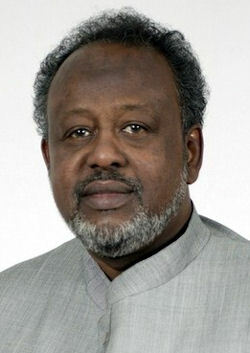 President Ismaël Omar Guelleh's Union for the Presidential Majority (UMP), which had held all the 65 seats in the National Assembly since 1999, saw its share reduced to 55 in the election of 22 February 2013. Although a multi-party system was introduced in 1992, no opposition forces had been represented in parliament since the country's independence in 1977. In 2013, however, opposition forces, united under the National Salvation Union (USN), and participating in parliamentary elections for the first time since 2003, took the remaining 10 seats in the National Assembly. The UMP ran on the government's record while the USN promised to promote democracy and tackle corruption. USN spokesman Daher Ahmed Farah, who had returned to Djibouti in January 2013 after 10 years of exile in Europe, denounced massive fraud. The 10 USN members refused to take up their parliamentary seats. The amendments to the electoral law, in force since December 2012, were applied for the first time. Previously, the electoral list which won the majority of the votes took all seats in each constituency. Starting from the 2013 elections, the winning list is entitled to 80 per cent of the seats and the remaining 20 percent of the seats are allotted proportionally to other lists which obtain at least 10 per cent of the valid votes. China has a particular way of seeing democracy, which seems to inspire the Djiboutian president. To annoy the "old lion", a politician forced into exile recalled that the notion of multiparty according to the Djibouti president was only a dream. On 21 November 2017, Mr. Daher Ahmed Farah, a Belgo-Djibouti, represented by Mr. Alexis Deswaef, filed a complaint in Geneva with the UN Human Rights Committee against the Republic of Djibouti to denounce the dissolution of the opposition party of which he is the president, the Movement for Democratic Renewal (MRD). The electoral confrontation took place 23 February 2018, regardless of the number of participants. The eternal question of participation or not arises every time. Djibouti is known to be a "special Republic," a republican backbone and a near-dictatorial command. As the parliamentary elections drew near, two major protagonists were already campaigning. Prime Minister Abdulkader Kamil Mohamed [AKM], and one of his best opponents, Daher Ahmed Farah [DAF], leader of the Movement for Democratic Renewal and Development (MRD). After boycotting presidential elections in 2016, Djibouti’s main opposition party, the Movement for Democratic Renewal and Development (MRD), would not participate in legislative elections, deepening concerns that democracy in the East African nation isn’t working. The main opposition has accused the leadership of the national electoral commission for being partisan towards the ruling party, charges denied by the body. The African Union deployed an observer mission led by Anicet-Georges Dologuele, former Prime Minister of the Central African Republic. The country's electoral commission "is not independent -- its chairman is the prime minister's legal advisor", according to Zakaria Abdillahi, president of the Djibouti League of Human Rights and a former opposition legislator. “In Djibouti, there’s a problem of legitimacy, of democratic legitimacy, of parliamentary legitimacy because elections are never fair and free,” Daher Ahmed Farah, the leader of MRD, told VOA. Farah said the government went back on a deal forged in late 2014 to establish an independent national electoral commission. Without an autonomous body to oversee voting, he said, it’s impossible to ensure the integrity of the process. Polling began at 6:30 am (0330 GMT) among 194,000 voters, who would choose 65 deputies. The ruling party was expected to sweep majority of the 65 seats at stake. Over half of the seats, 35, are in the capital where most opposition parties fielded candidates.